Team Stripes is a framework which is used to enhance teamwork and communication for clinicians working at the point of care. It is practical and structured and, recognising the diverse needs of most health care units, it is designed to ensure an individualised unit-specific approach to safety and quality improvement. 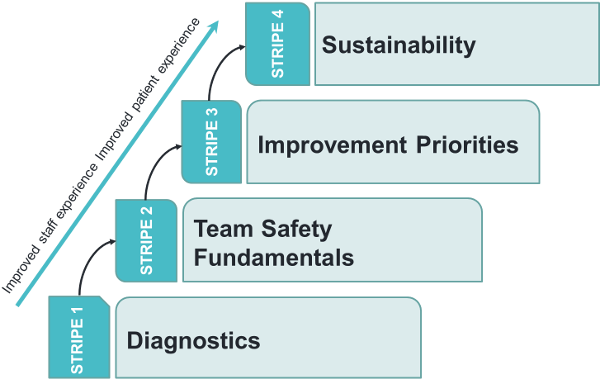 Recognising the diverse needs of most health care settings, Team Stripes starts with a diagnostic phase (Stripe 1) to gain an understanding of the current state. Participating teams work sequentially through each Stripe to gain a maximum of four Stripes before starting again. The use of improvement science methodology is needed to progress through the Stripes and teams are supported when building capability in using this methodology. This approach and the ability to choose programs based on priority will ensure sustainability and a unit-specific approach to safety and quality improvement. Team Stripes is informed by an extensive literature review, draws on the key characteristics of clinical microsystems and builds on the work of the CEC’s In Safe Hands program. Clinical microsystems in health care are where hands-on patient care is delivered. They are made up of clinical and non-clinical staff, patients and their families and carers. The use of the Team Stripes framework will equip clinicians with the tools, education and system awareness to foster a culture of safety with no tolerance for preventable harm.